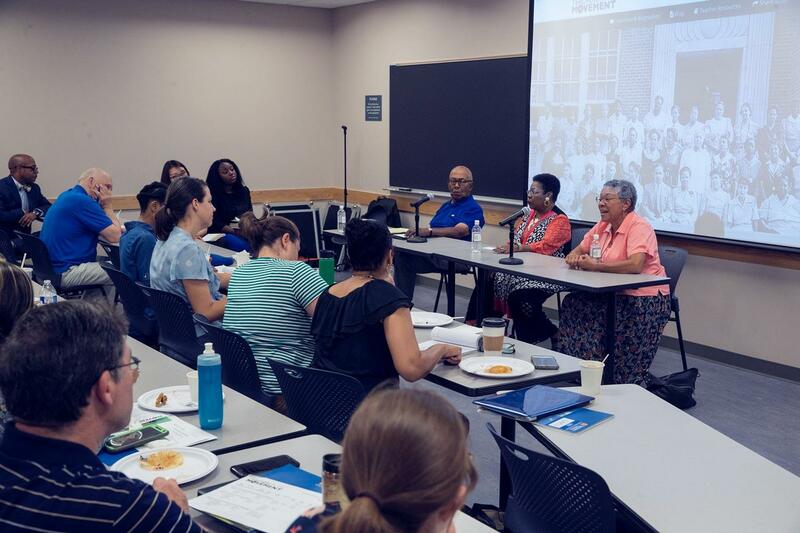 The Curry School’s Teachers in the Movement project hosted a five-day summer institute for local educators interested in oral history, the Civil Rights era and social justice. Last week, 20 educators from across Virginia gathered at the University of Virginia for an intensive five-day institute exploring civil rights and social justice in the classroom. With a focus on teachers during the American civil rights movement of the 1960s, the week’s conversations also expanded to include last August’s white supremacist marches in Charlottesville, hip-hop as social commentary, the true meaning of activism and more. The inaugural institute was part of “Teachers in the Movement,” an oral history research project housed in UVA’s Curry School of Education. It was co-sponsored by the Curry School’s Center for Race and Public Education in the South. The institute’s interactive format included guest lectures, workshops, instruction on recording and teaching oral history, a tour of Charlottesville’s prominent civil rights sites and a panel discussion with local educators who taught during the civil rights era and the following decades of integration and Massive Resistance. According to Curry School professor Derrick P. Alridge, director of the Teachers in the Movement project, while other professional development programs focus on the civil rights era, what distinguished this institute was its focus on teacher participation in the movement – and what today’s teachers can learn from the experiences of a previous generation of their peers. Throughout the week, guest speakers led sessions on the civil rights movement and the ways that teachers shaped that period of history. Alridge said he and the organizers carefully structured the institute to be engaging and interactive, seeking out scholar-practitioners who understood the perspective of educators and were equipped to lead deep discussions and hands-on workshops. One theme quickly emerged: that teachers need to acknowledge both context and complexity in order to teach a full and nuanced view of history. Tondra Loder-Jackson, associate professor of education at the University of Alabama-Birmingham, began the week’s events with a session centered on her book, “Schoolhouse Activists: African American Educators and the Long Birmingham Civil Rights Movement.” Drawing on her research, Loder-Jackson emphasized the ways, both conventional and unconventional, that teachers contributed to the Birmingham movement through their pedagogy, leadership and civic life. She cautioned attendees to look past the common narratives and dig deeper into primary sources – and to embrace the complexity of historical figures and events. On Friday, historian and former public school teacher Maco L. Faniel challenged attendees to confront and question their existing views of historical fact, particularly how the naming and recording of history imposes a certain viewpoint that might not accurately represent their students’ views or experiences. In addition to guest speakers, attendees spent a morning hearing from a panel of three local black educators – John Gaines, Deloris Campbell and Patricia Edwards – who served in Virginia schools during the 1960s and the following decades of integration and Massive Resistance. They spoke frankly about their experiences and advised teachers to stand up for what they believe in. Attendees also spent a large portion of the institute learning about the process of archival research and how to incorporate oral history and primary sources in the classroom. They created blog posts on civil rights and social justice issues – all, Alridge said, intended to help them see a fuller and more connected view of history. Candace Carter, a recent UVA graduate who will serve as a literacy tutor in Richmond in the fall, said the experience helped her think beyond the usual texts to see how to teach a fuller perspective of historical subjects like the civil rights movement and black history in America. Throughout the week’s events, a common thread wove many of the discussions together – one that touched on a deeper, more philosophical question: how to define activism in the context of classroom teaching. In a session called “Teachers and the Struggle for Social Justice: Past and Present,” Hale acknowledged a broad definition of activism that includes small acts of advocacy like questioning school board policies or requesting more funding. Through this lens, he argued that teachers held a powerful position as activists during the civil rights movement – and they still do today. Throughout the week, attendees grappled with this topic. They swapped countless resources, from movies to children’s books to academic research studies. They studied the activism embedded in everything from civil-rights-era curricula to modern-day hip-hop videos, and they shared anecdotes from their own classroom experience. Often, the thoughts they shared were personal. One teacher, speaking from experience about the difficulty of returning to the classroom after her school dealt with a threat of violence, said that in some contexts, teaching itself – simply showing up to work and prioritizing your students’ learning over your own fear – could be considered activism. Notably, none of the three Virginia educators who made up Wednesday’s panel described themselves as activists, preferring the term “influencer” or “advocate.” But they all agreed that teachers hold a powerful position of influence in both their classrooms and their communities. Leonard Hill, a high school English teacher in Fairfax County whose parents were both teachers, said the institute supported how he has always perceived his role as a teacher. With a group of Virginia educators, conversation often turned to Charlottesville’s own encounter with violent white supremacism last August. While Alridge said the idea for the institute was born long before those events, the institute provided an opportunity for deep discussion and personal connection. His goal, he said, was to help attendees view those events within the broader context of American history. “I hope they took away a more historically contextualized understanding of the civil rights movement of the 1950s and 1960s, and a greater understanding of that movement in relation to the events that are occurring in the United States today,” he said. By touring significant sites throughout Charlottesville and hearing from a panel of local educators who lived through the civil rights era in Virginia, attendees gained a deeper and more nuanced understanding of how the civil rights movement played out in their own backyard. Ultimately, Alridge said that the institute is just one small piece of an ongoing body of work. He plans to use the feedback from this first event to plan an even more exciting experience for teachers next summer, and in following summers, in addition to the rest of his work as director of both Teachers in the Movement and the Center for Race and Public Education in the South. Whatever the scope, the importance of teachers taking the time to think deeply about these subjects is crucial. Whether you call them activists, influencers, advocates or anything else, classroom educators play a critical role in our country’s history – and its future.